Schiavo Case, More March Madness on Capitol Hill In the latest Watching Washington column, NPR's Ron Elving gauges the net effect of the whirlwind week on Capitol Hill, marked by baseball and steroids, a budget divide and intervention in the Terri Schiavo case. Earlier this month, the Gallup Poll reported that the public approval rating for Congress had slipped to 37 percent -- the lowest it had been since the impeachment saga in the fall of 1998. It could be coincidence, but in the week that followed, both the House and Senate seemed determined to find the hot topics and demonstrate their political sensitivity. Day after day, Congress got on cable TV news almost as much as the NCAA basketball tournament. Even over the weekend, you could almost mistake CNN for C-SPAN. Was it all an effort to show the members' close connections to constituents? Or was it all more proof of how driven they are by constituencies? Congress always gets impressively busy in the days just before a recess. It has even been suggested that if the leaders want to get more done they should schedule more vacations. Still, the frenzy before this particular break was striking, especially for so early in the calendar year. Most unusual was the decision by Republican leaders to weigh in on the Terri Schiavo case. For years the nation has been witness to this family feud between the brain-damaged woman's husband (who says she did not want to be kept alive artificially) and her parents (who say after 15 years she could still get better). Pictures of Terri Schiavo looking awake and wearing make-up have helped distort the medical realities of this case, but after five years of adjudication the legal question had been thoroughly ground -- turned down twice by the U.S. Supreme Court. Nonetheless, with an air of just-waking discovery, Congress fell upon the case last week and decided to interrupt its recess, convene both chambers on Palm Sunday and haul President Bush back from vacation in Crawford, Texas -- all to enact a special law to take the super-adjudicated case to one more judge, one more time. 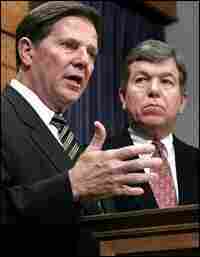 Whatever happens to Terri Schiavo, the TV-watching nation now has a new mental picture of House Majority Leader Tom DeLay (lately known more for allegations of impropriety) as the empathetic protector of an innocent victim. The same can be said for Senate Majority Leader Bill Frist, a surgeon often depicted as coldly scientific, who can now be seen as a zealous champion of what is called "the culture of life." The Democrats, meanwhile, decided they needed no further identification as the party somehow opposed to the culture of life and therefore chose the role of the matador, stepping aside to let the bull rush past. Just before the Schiavo avalanche began, we had seen the wise and judicious House holding hearings into the use of steroids in baseball. Had this proceeding taken place a few years ago, before the story had broken and the abuse been widely recognized, it might have made an important contribution. As it eventuated, the event seemed oddly ill-timed and disconnected from the normal regulatory, judicial or legislative process. But it made great TV. And now the country has a different impression of such demigods as Jose Canseco and Mark McGwire, among others. The regular business before Congress last week was the budget resolution, which is a guiding component in the process by which the nation raises and spends money. The amount in question for the new fiscal year is about $2.6 trillion, a figure that meets anyone's definition of Real Money. The budget resolution normally commands little news attention this time of year. But last week, in the Senate, Republicans were able to attach a rider opening the Arctic National Wildlife Refuge to oil drilling. That energy-versus-environment story worked well alongside news reports about record high oil prices. Within the week, however, the Senate threw the entire budget into doubt by stripping out its centerpiece cost-cutting measure: a shift of Medicaid funding from federal shoulders to states and localities. A major priority for President Bush and the Republican leaders in Congress, these cuts were the key test of the regime's resolve to reduce the current budget deficits without raising taxes. When the critical vote came, however, seven Republicans jumped ship, all citing the cries of pain they had heard from back in their home states. The White House and the leadership had pleaded with these seven not to gut the budget plan. But they defected, and combined with unanimous Democratic opposition to the cuts, they prevailed. The House promptly announced it was sticking to its guns on the cuts, prompting predictions that there would be no budget resolution this year. This greatly complicates the appropriations process and makes it all the more likely we will have an omnibus resolution in the fall, bundling most or all the government's actual spending decision into a single unreadable and unmanageable piece of legislation. Congressional leaders swore they would not do this again this year, but here we go again. It will be interesting to see whether this "week that was" will indeed lift the public estimation of the folks on Capitol Hill -- as the members must hope it will. But the larger question is whether Congress improves its image in the long run by trying so hard to do so in the short term. Do Americans disrespect Congress because they think the members are too remote, too engaged with lobbyists and too far removed from the people? After a week like we have just had, it's just as easy to argue that Congress loses respect with its reversals, its grandstanding and its preference for appearance over reality. For some, the Senate vote on the budget was simply a recognition of the excessive pressure these cost shifts are putting on states and localities. A somewhat different group may feel the hearings on steroids in baseball will help relieve that problem (and the scourge of drug abuse in general). And surely there are those who see Washington's abrupt entry into the Schiavo saga as a mission of angels. But for those who have been watching Congress closely over the years, the week was a lesson in how hard it is to maintain institutional focus -- even in times of war and fiscal stress -- and how much easier to pounce on emotional issues with TV appeal and a quick political payoff.